Often we believe that to find our spiritual purpose in life, we must leave our worldly belongings behind and live like a disciple or monk. But, I have come across two women, a pottery sculptress and a restaurant owner, who have had a profound influence in their communities. This weekend, I visited the Goathouse Refuge, a non-profit, no-kill cat sanctuary in Pittsboro, North Carolina. 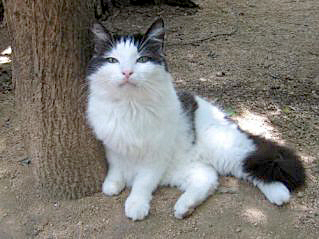 The refuge is part of a 16-acre farm with a 3.5-acre fenced, wooded area where the cats roam free. A small red barn serves as the entrance to the cat sanctuary, and on the other side, goats graze and live. When my family and I went for a visit, a volunteer who was eating her lunch in the small garden with a fishpond greeted us. She gladly closed her lunch and offered to give us a tour. She first showed us the special-needs room which had cages for cats that require extra attention or isolation. The next room was a screened play area, although the cats appeared to be lounging rather than playing. Then, we went to the open area. Cats came out to greet us, and some followed us as we walked along the paths under the trees. I was impressed at how well the cats got along. For cats that don’t have a home, this refuge was certainly the next best thing! Siglinda Scarpa, an Italian pottery sculptress, started the Goathouse Refuge. It’s obvious that an artist owns this farm by the way the old branch fences are artistically placed and how nature is so beautifully incorporated with the living spaces. She has a gallery on-site as well. 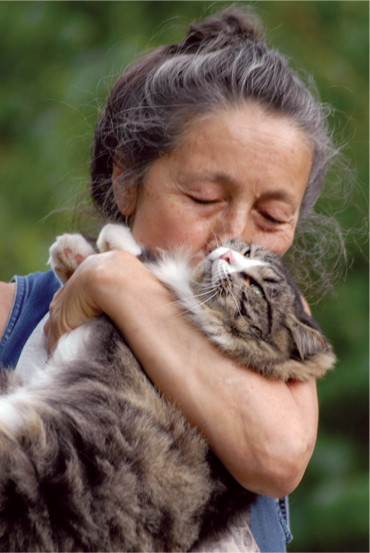 The refuge has volunteer opportunities and welcomes people to visit the cats to keep them social and happy. If a cat happens to win someone’s heart, then of course, adoption is a welcomed celebration. I liked the fact that the Goathouse Refuge has an application process that includes a home visit before the cats are given a new home. Another woman, Mildred Council, owner of Mama Dip’s restaurant in Chapel Hill, North Carolina was featured in my local newspaper. For the past 30 years, she has hired inmates from the Orange Correctional Center, and more recently began hiring from the Durham Correctional. For some of these men, this is their first real job. These days it is difficult for most people to find a job, but for these inmates, it’s almost impossible. I admire these women for giving back. They have shown that living a meaningful life can be found as a sculptress founding a cat refuge or a big-hearted restaurateur offering inmates a new beginning. Two ordinary lives that became bigger than life, because they let love guide their hearts.